1/2 Teaspoon fresh thyme leaves. Blender, Boxcutters, Teaspoons, Jigger, Shaker Classic/Boston, Citrus Juicer, Strainer, Large Martini Glass. 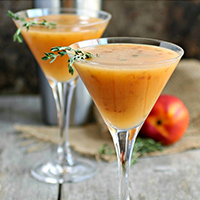 Place the nectarines in a blender or small chopper and puree until smooth. Pour into a cocktail shaker and add the gin, elderflower liqueur, lime juice, simple syrup and thyme. Fill with ice, shake well and strain into a chilled Martini Glass. Garish with a sprig of thyme, if desired.